Description: A young girl visits a store to buy some art supplies, where a pair of diminutive dinosaurs attach themselves to her. They present to her a magical pen and pad, which allow her to transform into an older version of herself, whom she dubs "Lala." She attempts to keep her alter ego hidden from her friends and family while pursuing a career as a top fashion model and idol star. Studio Pierrot, reknowned for its "mahou shoujo" (magical girl) series such as Magical Angel Creamy Mami and Magical Idol Pastel Yumi (as well as fan favorites like Kimagure Orange Road and Fushigi Yuugi), released its latest entry in that genre in 1998 with Magical Stage Fancy Lala. In many ways, Lala is a 90s update of Creamy Mami. Both revolve around a young girl who gains the magical power to metamorphose herself into an older girl, both feature girls who become idol singers, and both feature a duo of cute magical guardians that serve to guide and watch over the heroine (cats in Creamy Mami, dinosaur-looking things in Lala). 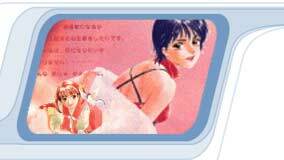 Both share attractive character designs by Takada Akemi (Kimagure Orange Road, Mobile Police Patlabor). Yet despite the fact that the story is not very original, the formula works. Young girls will surely relate to Shinohara Miho, an awkward nine-year-old girl and aspiring manga artist who suddenly finds she can transform into a lovely 15-year-old girl named Lala (voiced by Oomori Reiko, a real-life 14-year-old when this series was made). Through Lala, girls can magically become pretty, popular, and older. They can vicariously fulfill their fantasies of being an actress, model, or pop singer. They can even become the object of their favorite idol's affection -- Lala gets to do it all. Yet there is much more to this series than a sugar-coated spoonful of wish-fulfillment for young girls. The situations Miho gets herself into while attempting to keep her alternate identity a secret are frequently hilarious. Miho and her family are very human characters, and it is easy to empathize with their struggles. There is a delicate look at first love (Yamaguchi Kappei, doing his "young boy" voice, plays a classmate with a crush on Miho, though he would never actually admit it), and also a real mystery regarding the true nature of Miho's magic. Magical Stage Fancy Lala is a thoroughly charming -- and addicting -- magical girl entry with a truly surprising amount of depth. Highly recommended, especially to fans of Takada's work; after getting an eyeful of her wonderful character designs in this series, one can't help but wish she had been involved with the second KOR movie. This is a fun, engaging, comic fantasy, highly recommended. The art, music, and production values are top-notch for a TV series. LaLa belongs to the "magical girl" genre. Like many other magical girl characters, from Magical Princess Minky Momo to Akazukin ChaCha, the main character Miho (alias LaLa) is a very young girl who gains the magical power to become a (relatively) adult version of herself. Unlike many other magical girls, Miho does not transform to become a heroine; she does it just to enjoy herself. Miho's transformed self, teenaged LaLa, is scouted and hired as a model, and groomed and trained to be an actress and singer. As a result, she finds herself on a first-name basis with the handsome idol star she adores. But this story is not just a shallow wish-fulfillment fantasy. Miho/LaLa spends a lot of time in moral dilemmas, trying to do the right thing and fulfill her responsibilities to her friends and associates in both sides of her life, not to mention the comically difficult task of being a busy model and a full-time elementary student at the same time.